Over the last few weeks, we haven't been doing a lot of real work on the car - I'll bring you up to date on the work at the end. Instead, we've been taking it around to various places to show it off. The first place we showed it off was at the annual Gear Grinder Awards ceremony held at Joe’s Garage in Tustin California. This location houses the automotive collection of Joe McPherson and provides a large meeting /event area. It makes an excellent place to hold an automotive award ceremony and banquette. At last year’s event, we were unable to display our car since we were doing bodywork (it was ugly) and we were a long way away from being ready to race it. This year we weren't going to miss the opportunity, and since we were the points champions in the Gear Grinders the car had to be there. 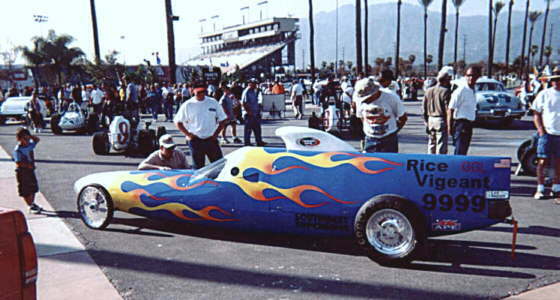 The week after the banquette, we took the car to the Irwindale Speedway for a “Festival of Speed” event. We were on display with several other “Lakes” cars and lots of other types of racing machines from the 1920’s up to the present day. Most of the people there had never seen a Bonneville car before. The excitement from these two public shows however was eclipsed by the simple package we received in the mail from the SCTA office last week. 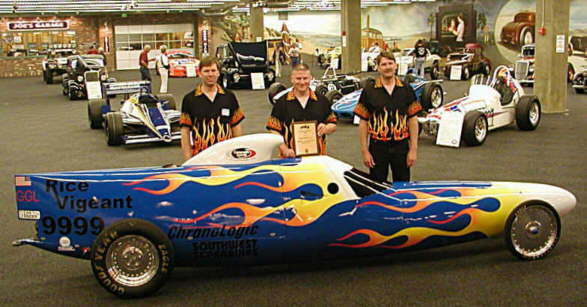 After 15 years of racing we had managed to be in the top five competitors and did so with a sharp looking car. 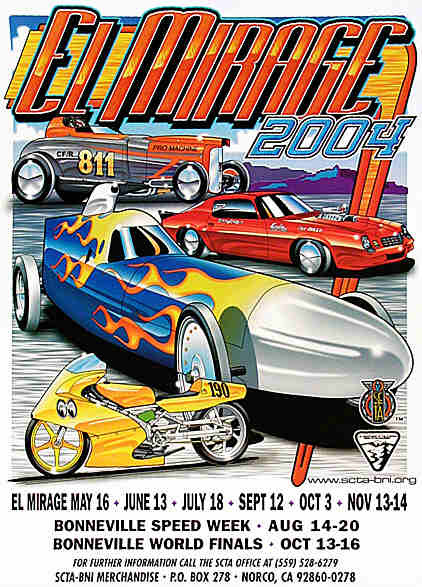 This effort paid off with our vehicle being prominently featured on the SCTA’s 2004 El Mirage poster! Last weekend we went back to working on getting the car read for the first race of the season. The biggest thing we needed to do was to get the motor to run. When we installed it a few weeks before, we plugged in all of the electronics and plumed all of the hoses but the motor refused to start. This time I had brought down a pile for advanced electronic troubleshooting equipment intending to quickly pinpoint the problem. I guess I scared it in to cooperation since it fired right up and purred like a kitten without having to resort to any real testing. This motor is on loan from Southwest Superbikes and is designed for NOS. It is a 1300cc H/FL motor and produces 240 HP; a lot more than we have ever run before. We also heard from Richard at Southwest that our G/GL motor (1545cc) is making 212 HP with 124 FP torque. This is looking like it will be a fast season!